When I began this blog some time ago, I wasn't sure which direction I wanted to take it. I knew it would focus on belief and acting upon that belief, but that was about it. The other day, though, I remembered something I've wanted to do for some time. Something that has been nagging at my subconscious for years. I love parables. My being a writer may have something to do with that. It seems to me a concept taught through a story has a longer lasting impact than one simply stated. Which is why I'll introduce a new parable each week. Last week was "The Parable of the Bloody Nose". It was a fitting kickoff to this new series of posts. I've received a lot of good feedback on it, reaffirming what I believe to be the Spirit's influence to take my blog in this direction. Without any further ado, I present this week's parable. I work as a traffic control volunteer at my son's school - a.k.a. crossing guard. We have some rules we ask parents to follow while dropping off and picking up their children from school. The rules are simple and resonate with common sense. Stay in your vehicle while in the drop-off/pick-up zone. No cell phone use during drop-off/pick-up times. Please buckle up your children before leaving school grounds. Most parents abide by these rules. They understand the rules are there for their safety and the safety of their children. Occasionally, a parent or grandparent needs a gentle reminder. They're usually repentant and quickly mend their ways. Sometimes a parent becomes indignant and refuses to comply. Inevitably, these individuals meet with unfortunate consequences - fender bender in the parking lot, interference from school administration or even police, etc. All because of their continued refusal to abide by the simple rules set for them. 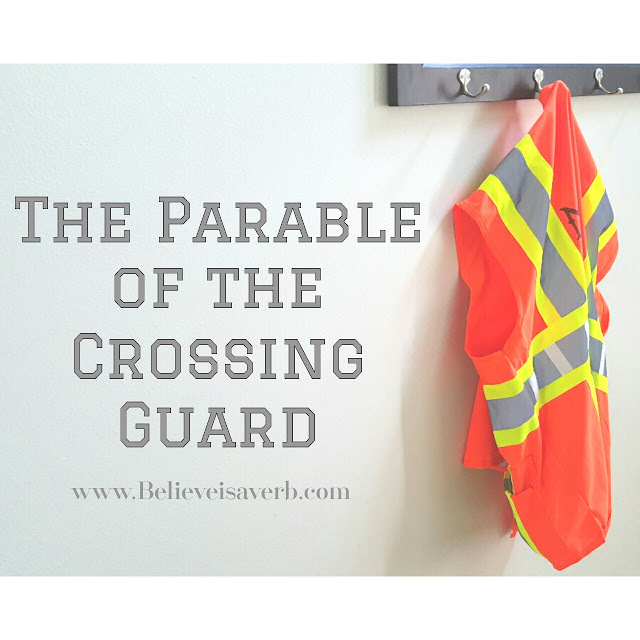 In our lives, we are provided with spiritual "crossing guards" who seek to keep us safe. They encourage us to follow simple rules to keep us spiritually sound. Most members of the LDS faith abide by these commandments, for we know they're there to ensure our eternal progression help us achieve eternal life. Occasionally, we need a gentle reminder to get us back on track. We are repentant and quickly mend our ways. Sometimes, however, we become indignant and refuse to comply. Our spiritual complacency allows for unfortunate consequences - falling away from the church, detrimental influence from the adversary, etc. All because of our continued refusal to abide by the simple commandments set for us. Let us always be vigilant and abide by the commandments our Lord and Savior has given us, for He has given us a way to safely navigate this life so we may someday return to Him and live eternally in His presence. It may not always be easy. We may not always like it, but He knows what's best for us. He only wants to see us safely home.